According to Barbara Slavin, ISH Board Member and 2012 Gala Chair, Chuck Hagel didn’t hesitate for a second when she asked him to be the recipient of the 2012 Global Leadership Award from the International Student House. That’s because Hagel, the former two-term Senator from Nebraska who now teaches at Georgetown University, chairs the Atlantic Council and co-chairs President Obama’s Intelligence Advisory Board, understands that the biggest power the United States wields in the world comes from the example of our free society. 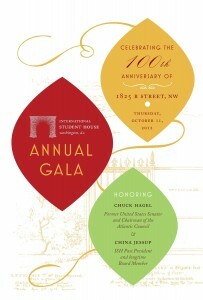 Plans are now well underway for the 2012 fundraising Gala which will be held at ISH’s 100-year-old historic mansion on Thursday, October 11. This year, former Senator Chuck Hagel is being honored in recognition of his exceptional commitment to promoting intercultural dialogue, international education and peaceful global citizenship. Senator Hagel has been a longtime proponent of ISH’s work, and his wife Lilibet recently joined the Board of Directors. ISH is also proud to honor China Jessup, longtime Board Member and ISH Past President with their Lifetime Service Award. Tickets are on sale now! Patron Ticket = $250 per person; Benefactor Ticket = $350 per person. Individuals who purchase tickets at the Benefactor level ($350 per person) and major sponsors will be invited to a special, post-Gala reception honoring ISH and Senator Hagel hosted by Ambassador and Mrs. Delattre of France at their lovely residence on Wednesday, October 24, from 6:30 to 8:30 pm. Ambassador and Mrs. Delattre are the Honorary Diplomatic Chairs of the Gala. For more information, to purchase tickets, to receive a formal invitation or to learn about sponsorship opportunities, please contact Judy Singer, Director of Development, at 202-232-4007 x210 or by email: [email protected].